As the semifinal of the eighth series of Britain’s Got Talent airs, we asked Karen Kidman, who entered the contest with her daughter, to tell us about their experience. Part two will appear next week. Name of act: #priceless – because you just can’t put a value on it! Description of act: An inspiring mother and daughter duo combining powerful performance, dynamic dancing and extreme singing. Needless to say the other boxes were completed in a similar tongue-in-cheek style; we laughed a lot, and then forgot all about it. 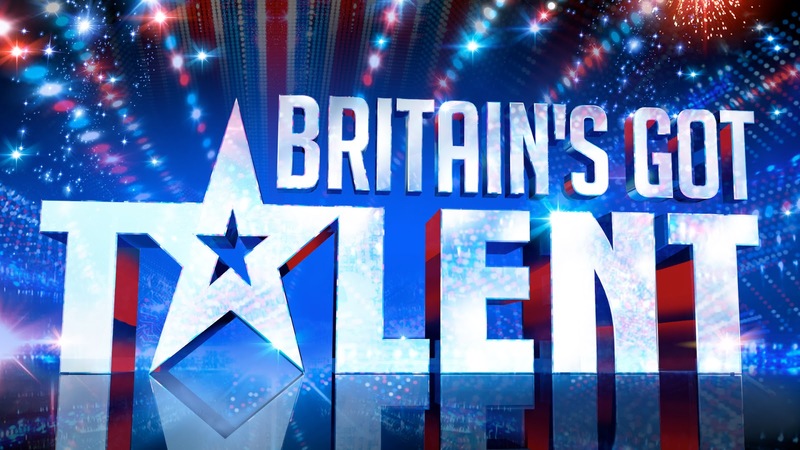 A few months passed and then one day Coralie received an email from Britain’s Got Talent inviting us to an open audition in London in November. Coralie was of course thrilled – I was less so. We both agreed on one potential problem, though: we didn’t actually have an act, and the audition was two weeks away. Over the course of the two weeks I was persuaded that to take part would be a shared experience that we would never forget, so we got to work developing a slightly bonkers outfit and a ninety-second routine. We collected ideas from friends, family and colleagues, downloaded some free editing software and tried to merge a few suggestions together into a backing track. 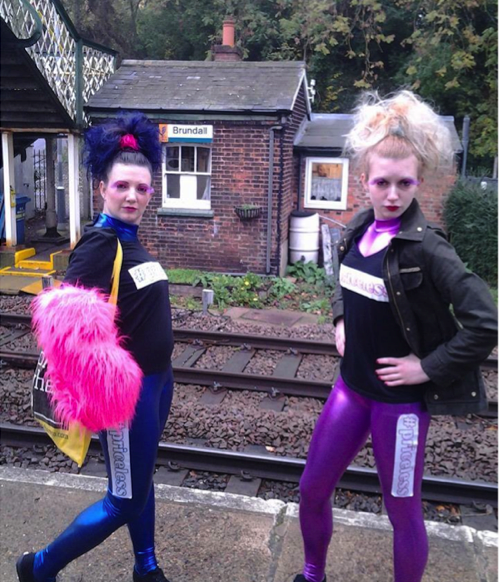 We also managed to purchase striking metallic catsuits in contrasting colours, and accessorised them with fluffy leg warmers. We had a couple of rehearsals squeezed into our kitchen with family and friends offering constructive criticism and three large dogs getting in the way and occasionally joining in. The whole thing was starting to feel a bit surreal and quite ridiculous. On the day of the audition we had an entourage of eight people all wearing supporters’ t-shirts, and together we set off to London (in full dress and make-up) at about 7am. If you look closely you can see a horrified station manager peeping out of the net curtain behind us. 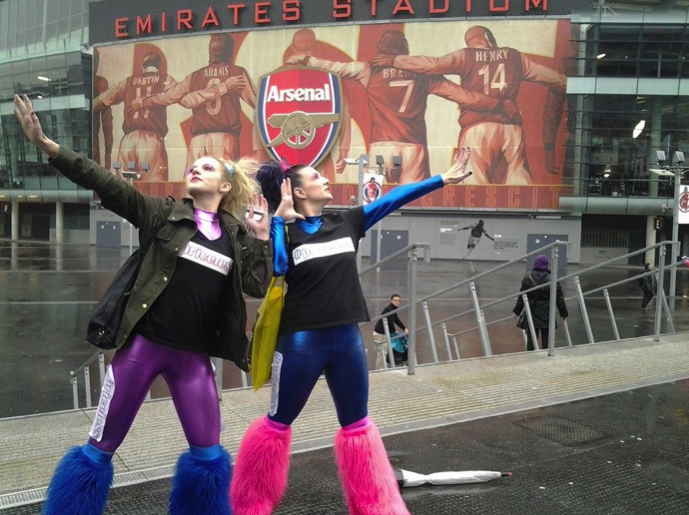 We arrived at the Emirates Stadium in plenty of time for our 1pm audition slot and joined a queue outside in the rain. We were actually quite surprised at how small the queue seemed; we were expecting hundreds of people in swarms, queuing for miles, like the shots you are shown on the TV, but we actually waited less than an hour before entering the stadium and disappointingly there were no visible cameras or flags or excited cheering at all. We met a few of the other auditionees during our wait, who all seemed to have genuine talents and were rather intrigued as to what our act was, which proved quite difficult to describe and therefore was generally left at “sort-of dancing”. Everyone was slowly processed and issued with very exciting audition number stickers, then escorted to the holding room. Once everyone was in we were told that there would be two rounds of auditions in one day: everyone would have a first audition with some producers of the programme and would be told instantly if they were through or not; those who were not successful could go home straight away. If you were put through the first round then you performed again in front of the executive producers and filmed, and wouldn’t know the outcome until the televised auditions were due to take place. Next we were all ushered outside and asked to walk up the steps approaching the venue as one large crowd. Then we had microphones attached inside our catsuits, were positioned within a collection of people and asked to talk about how we were feeling, the judges, the best possible outcome, what could go wrong, and to act as if we were about to go on stage in front of the judges. After five hours of waiting – we were told they left us in the holding room for so long because our bright colours made the shot look good – and having witnessed anger, tears and frustration from returning nominees, we were finally escorted down several corridors to the audition room. It would be fair to say that this last group to audition was a collection of oddballs and I was now starting to feel a bit sick. I didn’t really want to get through the audition as it would mean having to do the act twice, but somewhere my pride was getting involved and not wanting to have come all that way and just be told we were no good (which we already knew). More importantly, we had come to prove a point and wanted to be right – that this was not about talent, it was about entertainment, and we could definitely provide that. We entered the room and found ourselves facing two tired and fed-up looking men. Our audition went very quickly and not really the way we had rehearsed it, but we fed them enthusiasm and personality by the bucketload, and after some consultation they passed us a ticket and said “You’re through”. Before we could process this in any way we were immediately ushered off to the other end of the stadium by one of the runners (who, like all the crew we met, was lovely). In a bar area we were then photographed and issued with an eight-sided A4 questionnaire to complete in which we had to tell them about our ambitions, our performing history, which celebrities had “inspired us” and what “traumas” we had overcome, presumably in order to prepare some sob stories for successful auditionees. It was emphasised to us again that our second performance would be filmed to allow for shortlisting at a later date, and that we wouldn’t know today whether we were through to the next stage. If we hadn’t heard anything by February, they told us, we had been unsuccessful. Nine hours after arriving at the Emirates Stadium we were reunited with our supporters and free to journey back home. We reflected that it had indeed been an interesting experience, if only to find out more about what really happens in the lead-up to the televised show. We had both enjoyed the day, but I for one was relieved it was over. Part two of this article will appear here next week.